Osprey boat tour? That was the email subject line from my friend Ann inquiring whether I’d be interested in this boat trip. Of course I would! What better way to check out many of the Osprey pairs from a bay vantage? Disclaimer: I am one of the many Richmond and Rosie, sfbayospreys.org-obsessed viewers. And so is my retired husband. Before I leave for work, the webcam site is left up onscreen, full sized, so he can check on them throughout the day. So as soon as I signed up, my husband piped in that he wanted to go too. Monday morning we swung by to pick up Ann and another friend and drove the short distance from Pt. Richmond to the Marina Bay Yacht Harbor where we boarded Tideline’s boat for the 10:00 am Wild Osprey Cruise. The weather cooperated—calm waters, moderate air temperature, clear skies, and no wind. Tony Brake provided background about the increase of nesting pairs within the past twenty years and showed us maps with successful and unsuccessful nest site locations. 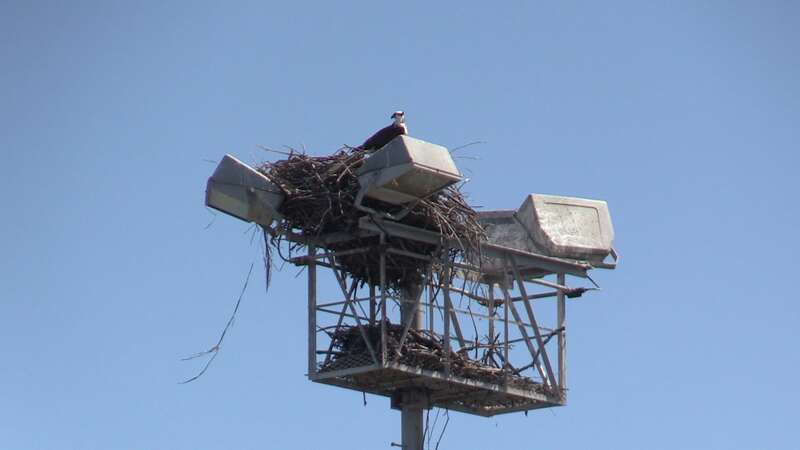 Ospreys will use quite a variety of structures, including relic cranes, utility poles, industrial light standards, as well as purpose-built platforms, along urban shorelines. Appropriately, as it was Memorial Day, the first stop was to view the nest atop the Whirley Crane next to the Red Oak Victory ship. Rosie was in the nest with Richmond nearby on the cables. 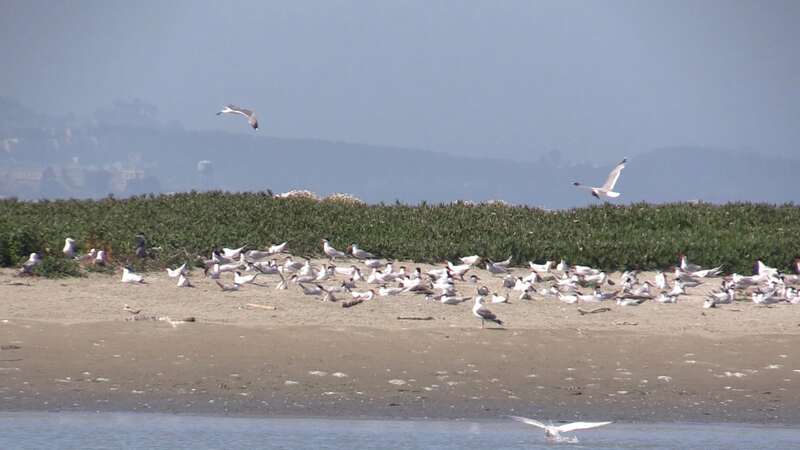 As the boat passes by the shore of Brooks Island, a variety of birds can be seen on the sandy spit: Brown Pelicans, the largest known Caspian Tern colony, and Western Gulls. Two ospreys were easily observed sitting in a nest built on a low platform just beyond Sandpiper Spit in Brickyard Cove. This was by far the closest we were able to see these magnificent birds without the aid of a webcam! Moving north, along the way, other nests are visible with binoculars including one next to the Richmond/San Rafael Bridge that I see while driving to and from Marin. Passing under the bridge the boat takes us to more nests built atop lighting structures at the ends of piers coming from Pt. Molate. One nest, seemingly empty, reveals some movement—we see chicks. An osprey takes flight from an observation perch and flies to the nest. We can hear a chirping vocalization from another of the ospreys. Better move on. We head toward Point San Pablo where yet another platform has been added to a utility pole and an osprey perches on an adjacent pole. Just as we are making our way between the East and West Brothers Islands the captain calls out ‘Harbor Porpoise’! Just as quickly as it surfaced it went down. If you blinked you missed it. Luckily, I didn’t blink! 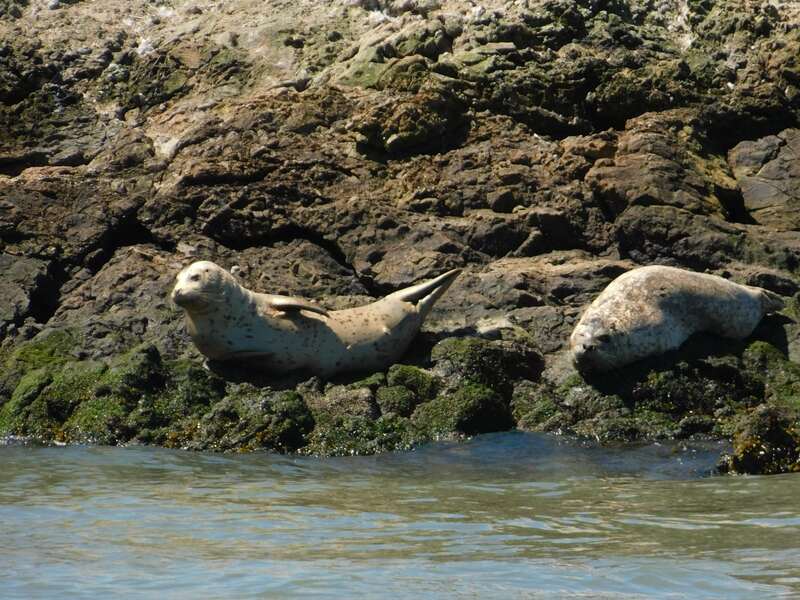 Harbor Seals, Double-crested Cormorants, and a few gulls are taking it easy on West Brother. Heading back, we again pass under the bridge and make our way toward Red Rock. The closest I’ve been to this island is while driving across the bridge. I am surprised that it is much larger than it appears. Egrets dot the green vegetation while gulls on the rocks make for a stark contrast of white against red. A nice image to end the cruise. Melani King lives in Pt. Richmond with her husband David and three dogs. She looks forward to weekends when she can go birding, always with her video camera, in the event that she can record some interesting bird behavior.